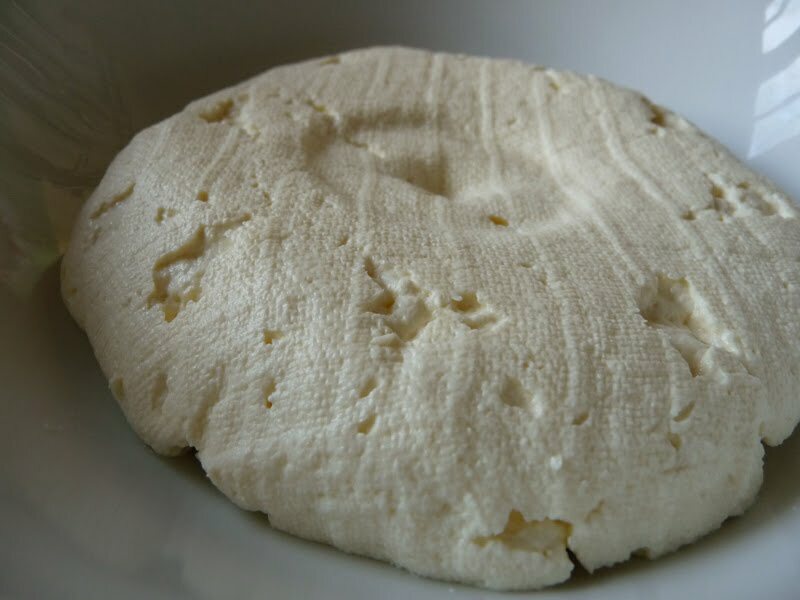 One thing I love to do back in Italy is to delve a spoon into a thick, creamy pile of the locally made sheep ricotta. The light, grainy texture and sweet creaminess as well as the dense farmyardy taste is wonderful. Nothing like the watery, bland and smooth pap you get in the plastic container in the supermarket. Nothing, not even close. I'm not even sure they should be calling it ricotta as it's likening a decent mature cheddar to something like a tube of Primula. As there are quite a lot of Italian recipes that call for ricotta as an ingredient like ravioli, cakes or even Sicilian cannoli it's always a bit disappointing to use the store bought stuff. But little did I know that it is really (like really, really) easy to make a homemade "version"* of ricotta that is good for using in recipes, cheap as chips and quick. Nothing will be as good as the real deal, but this is a million times better than supermarket ricotta. As with all simple recipes, quality of ingredient is king. For the milk only bother making this with full fat Jersey or other quality milk or if you can get hold of sheep milk then it will give you a more authentic flavour. You will also need a cooking thermometer and a square of cheesecloth or muslin, remembering to boil the cloth between uses (I use baby muslins that can be easily picked up for a couple of quid). You'll also need rennet which is an enzyme found in a sheep's stomach. Apparently you can get it in chemists but the pharmacists I encountered when I asked just looked at me like I was a loon. Vegetarian rennet is much easier to find in supermarkets, specialist food and health shops. There are also recipes that you can substitute rennet with white vinegar, lemon juice, buttermilk, but this is a little closer to the real deal. Lay out a double layer of muslin inside a fine colander and place over a bowl. Gently heat the milk to about 40°C. Take off the heat and add the salt and rennet (usually 10 drops or 2 scant teaspoons but check the packaging). Stir this through once and leave so stand undisturbed somewhere warm until the curds and whey separate. This can take a few minutes to an hour depending on your milk. Put the pan back on the heat until it reaches 40°C again. Using a slotted spoon, gently lift the solid curds out into the muslin/cloth. Don't be tempted to squeeze or flatten the curds! Let the solids drain and you can control the firmness of your resulting cheese, the longer you leave it, the firmer it gets. I leave mine about 30-40 minutes. Pop in a air-tight container and it's good in the fridge for 2-3 days. You can now use the rictotta (or just slater on bread!) I made some simple filling for a mid-week raviloi. Mix all of the above in a bowl until well combined and use to fill ravioli. My base pasta recipe for making by hand or with a stand mixer can be followed here. Use 200g of flour and 2 eggs for 2-3 people. 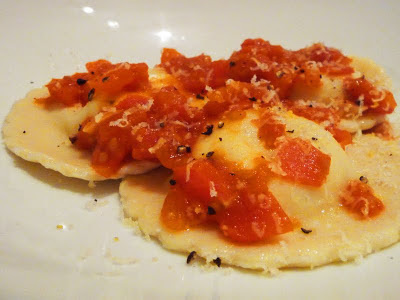 Serve with a light, fresh tomato sauce, which you can make by softening half an onion in olive oil. Add 3-4 fresh and fragrant tomatoes which have been chopped. Season well and cook until the tomatoes begin to disintegrate. * I say "version" because ricotta (meaning recooked) is a cheese made with reheating the whey left over from other cheese production like mozzarella and this uses full milk.